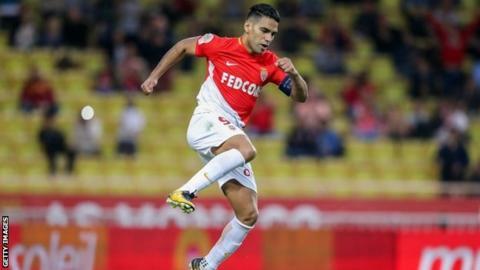 Radamel Falcao kept up his excellent scoring start to the season as Ligue 1 champions Monaco beat Caen. Keita Balde scored his first Monaco goal to put them ahead as he raced onto a Thomas Lemar pass, before holding off a defender and slotting home. Colombia striker Falcao scored his 13th league goal of the season - in nine games - from a controversially awarded penalty in the second half. Jan Repas' foul on Rony Lopes appeared to be just outside the penalty area. Monaco are three points behind Paris St-Germain, who visit third-placed Marseille on Sunday (20:00 BST). Match ends, Monaco 2, Caen 0. Second Half ends, Monaco 2, Caen 0. Attempt missed. Christian Kouakou (Caen) left footed shot from the centre of the box is high and wide to the left. Assisted by Ivan Santini following a set piece situation. Frederic Guilbert (Caen) wins a free kick on the right wing. Substitution, Monaco. Adama Diakhaby replaces Rony Lopes. Foul by Stef Peeters (Caen). Adama Traoré (Monaco) wins a free kick in the attacking half. Hand ball by Christian Kouakou (Caen). Ivan Santini (Caen) wins a free kick in the attacking half. Corner, Monaco. Conceded by Youssef Ait Bennasser. Jan Repas (Caen) wins a free kick in the attacking half. Offside, Caen. Stef Peeters tries a through ball, but Christian Kouakou is caught offside. Substitution, Monaco. João Moutinho replaces Youri Tielemans. Attempt missed. Falcao (Monaco) right footed shot from outside the box is too high. Offside, Caen. Baissama Sankoh tries a through ball, but Ivan Santini is caught offside. Jan Repas (Caen) wins a free kick in the defensive half. Corner, Caen. Conceded by Andrea Raggi. Corner, Caen. Conceded by Danijel Subasic. Attempt saved. Christian Kouakou (Caen) right footed shot from outside the box is saved in the top centre of the goal. Assisted by Stef Peeters. Corner, Caen. Conceded by Jemerson. Offside, Caen. Ronny Rodelin tries a through ball, but Christian Kouakou is caught offside. Substitution, Caen. Stef Peeters replaces Julien Féret. Substitution, Monaco. Adama Traoré replaces Keita. Corner, Monaco. Conceded by Baissama Sankoh. Attempt blocked. Keita (Monaco) right footed shot from outside the box is blocked. Assisted by Youri Tielemans. Attempt missed. Julien Féret (Caen) right footed shot from the centre of the box misses to the left following a set piece situation. Fabinho (Monaco) is shown the yellow card for a bad foul. Substitution, Caen. Christian Kouakou replaces Herve Bazile. Falcao (Monaco) wins a free kick in the defensive half. Keita (Monaco) is shown the yellow card for a bad foul.